Clinical decision-support systems can lay the groundwork for better and safer care, but the process requires plenty of heavy lifting prior to implementation. 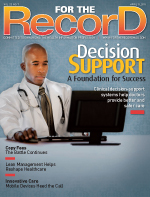 Besides requiring computerized physician order entry (CPOE), meaningful use criteria specify that providers who want to qualify for federal financial incentives implement clinical decision support (CDS) in the form of drug-drug, drug-allergy, and drug-formulary checks as well as five CDS rules relevant to specialty or high clinical priority, including rules for diagnostic test ordering. Providers will also need to demonstrate the ability to track compliance with those rules. As many organizations are currently struggling to meet the requirements, how can they ensure that their CDS systems will achieve the ultimate goal of improved patient safety? So far, success has been elusive for many hospitals. A research report published in the April 2010 edition of Health Affairs (“Mixed Results in the Safety Performance of Computerized Physician Order Entry”) studied a national sample of 62 hospitals that voluntarily used a simulation tool designed to assess how well safety decision support worked when applied to medication orders in CPOE. The assessment tool mimicked what happens when a physician writes an order in an EHR using CPOE. The simulation tool detected only 53% of the medication orders that would have resulted in fatalities and 10% to 82% of test orders that would have caused serious adverse drug events. While top-performing hospitals achieved scores of 70% to 80%, many hospitals performed poorly—the mean score was 44% of potential adverse drug events detected. Developing rules and keeping them up-to-date with the latest medical research is an almost insurmountable task for most organizations. ProVation’s electronic order set authoring and maintenance tool utilizes evidence-based clinical content from Wolters Kluwer’s UpToDate, an electronic medical reference system. The company also offers Medi-Span and Medi-Span Clinical, an electronic medication decision-support system that integrates with EMR/CPOE systems to provide drug-interaction, route-contraindication, and drug-allergy alerts as well as links to supporting medical evidence. Steve Claypool, MD, Wolters Kluwer Health’s vice president of clinical development and informatics, says the system delivers a library of evidence-based electronic order sets for many medical conditions. A recent study by KLAS Research (“Clinical Decision Support: Striving for More Intelligent Care”) divided CDS into five key areas: evidence-based order sets, multiparameter alerting, evidence-based nursing care plans, evidence-based reference content, and drug information databases. Of the 100 hospitals surveyed (all of which had full EMRs and CPOE), 38% indicated that electronic order sets had the biggest impact on improving quality and safety, patient length of stay, and mortality rate. Nearly 50% of the study participants used third-party order sets, while about one-quarter opted for homegrown solutions. Nineteen percent and 10% of these survey participants, respectively, stated that evidence-based alerts and reference content were also having a positive impact on the organization. Standardizing care with electronic order sets can also save money when the order sets are properly implemented and maintained. Hess cites an example of a hospital that used to order two units of blood every time it needed blood. In addition to helping ensure medication safety, CDS order sets can also reduce unnecessary testing. While content can be readily obtained from a vendor, the real challenge comes during the implementation of CDS systems. Here it’s important to realize that CDS systems are not plug-and-play. Providers can take several steps to prevent alert fatigue. Namely, they should prioritize. Large headaches could be averted if healthcare organizations are willing to spend the time and resources to analyze data prior to implementation. If done correctly, there’s little doubt CDS systems can be advantageous on several levels. “While it can be a struggle to implement CDS systems and make the necessary changes to workflow, it’s almost unanimous that physicians don’t want to give them up once they’ve become accustomed to them,” says Classen. Eisenberg sums up the goal of workflow integration by referring to HIMSS’ “Improving Medication Use and Outcomes With Clinical Decision Support: A Step-by-Step Guide.” It describes CDS’ “five rights” as getting the right information to the right stakeholder at the right point in workflow through the right channel in the right format. For organizations that want to evaluate the effectiveness of their CDS implementation, the National Quality Forum has developed CDS Taxonomy, a classification and categorization of the information necessary for quality improvement as described in “Clinical Decision Support, Driving Quality and Performance Measurement — A Foundation for Clinical Decision Support” (2010). • Action step: any action or event presented to the user of a clinical system that could lead to successful completion (or realization) of the intended mission of the rule.